Julia and Patrick have been best friends ever since Julia moved to Plainfield several years ago. They do homework together every night, help each other study for tests, and they both belong to the Wiggle Club. Wiggle is actually Work-Grow-Give-Live (WGGL = Wiggle), a 4-H type club whose members are now starting to prepare projects for possible entry in the state fair. When Patrick comes up with the idea of raising silkworms, Julia immediately balks. The project seems too Korean to her. She'd much rather do something "American". Knowing she can never talk Patrick out of his idea, she reluctantly goes along with it, though she's counting on something to go wrong and nip Project Mulberry in the bud. Can Julia secretly sabotage the project? And can she do it without Patrick hating her? This was my second reading of Project Mulberry and I like it quite a bit. The thing that strikes me most about this book is its discussion on race. First of all, Julia feels self-conscious about doing the "weird Korean project". At the same time, her mother is teaching her Korean embroidery (different than Chinese or Japanese embroidery because when you're done it looks the same on the front and the back). Julia's caught between wanting to take pride in her heritage and wanting to blend in with her white-bread neighborhood. 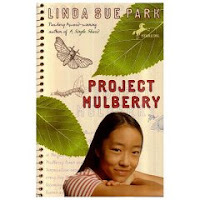 Another interesting issue that arises is between Julia's mother and the African-American man that offers his mulberry leaves to help their project. Julia knows right off the bat that there's going to be a problem because her mother doesn't like black people. It's not something that Julia and her mom have ever really talked about, but Julia pieced it together after she had a black teacher in the fifth grade. Julia's afraid to confront her mother about it because she's afraid that the confrontation will reveal that her mother is racist and Julia doesn't know how to deal with that. Later in the book, Mr. Dixon says something racist, too, and Julia learns that people of all races can have prejudices. When an unexpected issue comes up with the silkworm project and Julia can't decide what to do, she realizes that there are no perfect solutions to anything. "Maybe everything in life had its messy bits. Things other people didn't see. Or didn't know they didn't know. Or didn't want to think about. One other thing I want to point out about this book. In between the chapters, Ms. Park inserts little "conversations" between herself and the main character. The purpose of these inserted bits is to show a little of the "inside story". Ms. Park talks about how she came up with characters, some parts that were based on her own life, etc. I don't know what to make of these, really. Personally, I found that they disrupted the story. The first time I read the book, I read them. This time, I skipped them, but I found that the story still felt disjointed in parts. Maybe kids really love those inserted bits. I could certainly see how it might appeal. And if it was left to the end in an author's note, kids might be less likely to read it. I dunno... What do you think? ?